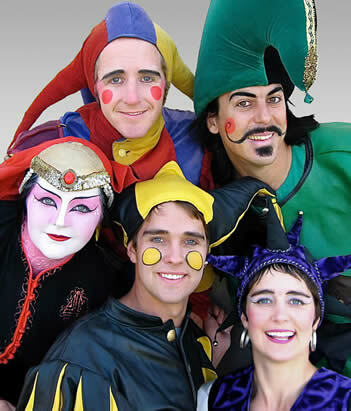 CLAN TYNKER is a troupe of brothers and sisters who perform a stunning array of talents in a fanciful "Vaudeville" style of Circus. Their all-ages show presents an amazing menagerie of entertainment from "around the world" set to an exciting live musical soundscape. Dazzling juggling skills are on display! Other highlights of the show consist of stage magic, stilt walking, unicycle riding, Central Asian dance, comedy, audience participation, sword swallowing and fire-eating. The show culminates with a dizzying array of danger stunts and climaxes with a spectacular fire performance. In addition to the show, the troupe can also provide colorful “Roving” entertainment, adding color and excitement to any event. This provides character work, with close-up sleight-of-hand magic, towering stilt people, a magical jester statue, the dancing china doll, amazingly tall unicycle riding, bubble magic and more. The Clan Tynker has also worked in the Hollywood film industry, with names such as Ron Howard,Cate Blanchett, etc. They were highlighted in "Beer for my Horses" starring Willie Nelson, Ted Nugent, Toby Keith & Rodney Carrington. They have added their unique talents to Concerts, Festivals, City Events, Renaissance Fairs, Libraries, hundreds of private functions, in the streets, and at festivals throughout the world. France, Germany, Italy, Scotland, Egypt and most recently Costa Rica. Based out of Santa Fe, New Mexico in the United States, the Clan Tynker have been together professionally since 1995. See pictures of our trips on the" WHERE" page or Facebook link on the "CONTACT" page.